Can I tell you how much I absolutely LOVE Halloween? It is probably my favorite holiday of all. Which is really funny if you consider that I hate to be scared. I'm so bad that I have nightmares from walking through rooms with horror shows on. But Halloween is so much fun. 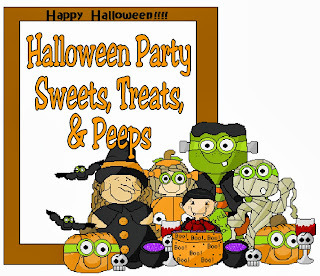 I love the colors and the sparkle and the fun side of Halloween. Not to mention the chance to eat more sweets and treats. To kick of this month, I wanted to share some fun Halloween decorations, treats, and party favors that I found from the small business shops on Etsy. Hopefully this will kick start your Halloween fun too! You have a lot of great ideas here. I am going to pin this!